I have had to make the difficult decision not to book any Autumn/Winter fairs this year due the need to have two of us in the shop on Saturdays at the moment. We can call upon our son as extra staff, but by the time we've paid him and stall fees, there is little chance of making much profit. Not having a Baljaffray Handknits stall at the Byres Road Makers Markets this Autumn is particularly sad as they are coming to an end after November's! These markets have been my favourite - the place where I have been encouraged, made new friends and, in a sense, the place that led to the opening of our shop, Janet & John. I would like to take this opportunity to say thank you to the lovely couple who have run the Makers Markets for all their hard work over the last several years and to wish them every success in whatever they are planning for the future. However, all is not lost as we are attending a number of fairs with the shop in the run-up to Christmas, which will feature my knitting, especially Christmas themed items. All the fairs listed on my "Craft Fairs" page will feature Janet & John stalls. My Christmas range will include this Price & Kensington 2 cup tea pot with sparkly festive cosy, priced £10. A large range of my knitting is available in Janet & John, this year displayed in a stand outside the shop. There is also a range at the Loch an Eilein Gallery (until the end of October) and a smaller one at The Magpie's Eye Gallery in Govan. See the "Shops Which Stock My Knitting" page for more information. I'm delighted to be able to announce that I will again be exhibiting at the Loch an Eilein Gallery this year. The Gallery is situated on the Rothiemurchus Estate near Aviemore and will be open from Easter weekend until the end of October. This year the Gallery has increased the number of artists and crafters exhibiting there. As space is at a premium, I will be selling a reduced range of my work through them, concentrating on wearables: hats, headbands, scarves, mittens and long and short fingerless gloves. Happy New Year - My News Round-up. There is currently a sale in the shop where my cable cushions are reduced from £24/£25 to £18, there's £1 off my drawstring bags and my mug cosies (£4) come with a free mug. The sale ends on Sunday January 18th. Winter goods will continue to be available in the shop until late February or early March. The only other shop currently selling my work is the Magpie's Eye Gallery in Govan. They have much reduced the area given over to arts and crafts and Baljaffray Handknits only has one shelf now (bottom shelf of bookcase immediately to the left of the till desk). I will be restocking them in the next few days. I'm waiting to hear if I will be exhibiting at the Loch an Eilein Gallery again this year, which usually opens towards the end of March. My work was popular again there in 2014, so I'm hoping to be able to do so. Unfortunately, my time at the New Lanark Gift Shop seems to be over as they no longer sell crafters work there. I'm currently working on some new designs for 2015 and hope to share these with you very soon, but here's the first - a new design of mini teacosy for a 2 cup pot. This one is currently on sale in Janet & John (£6 or £10 with Price & Kensington teapot - prices will vary in other shops). It was great to see Strathearn Fleece & Fibre again on Monday at the New Lanark Spring Food & Gift Fair. As well as having their stall, they were giving spinning demonstrations during the day. taken, at one time used by The Makers Markets as a publicity shot. I've come to love their wool since I first came across them almost 18 months ago at a craft fair in Edinburgh. 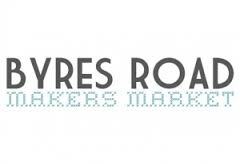 I've since been able to buy wool from them much closer to home at Byres Road Makers Market, when they've exhibited there. If you're a knitter in Scotland, look out for them at fairs and markets, as they travel quite widely. One of the things I love about their wool is that they produce it themselves from their own sheep. In European Union "speak", it's a form of diversification. 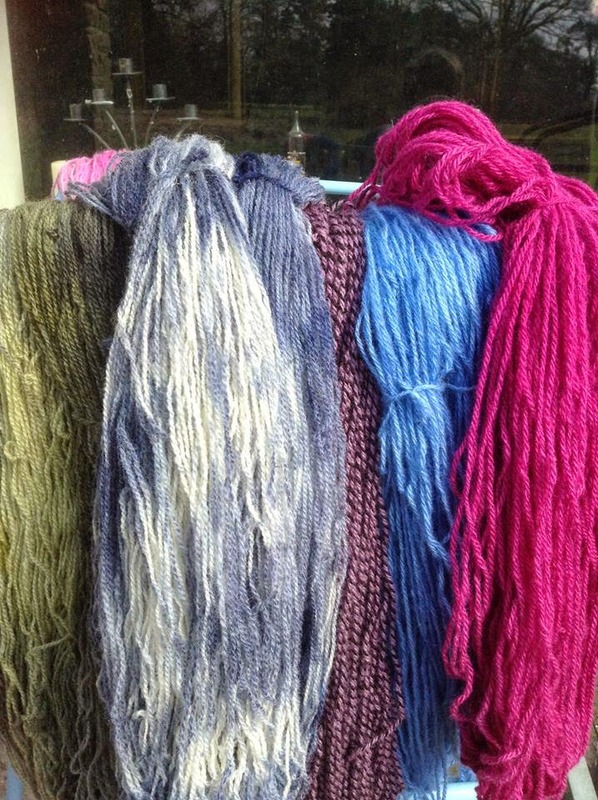 Although some parts of the process take place off their farm, they hand dye their wool on-site in an amazing array of colours. As I was buying from another stall (see previous post), plus two large skeins of New Lanark wool, I restricted myself to just one skein on this occasion. Although I usually pick some of their more vibrant colours (especially their yellows, which New Lanark don't produce), I opted to a more gentle mix of blues and cream in chunky this time. 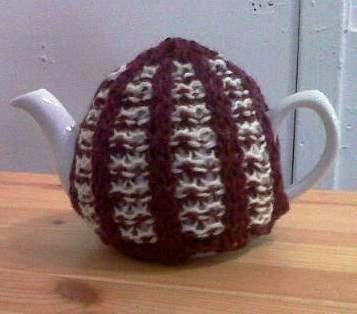 I used a third of the skein to knit this cosy for a 6-8 cup teapot. The simple pattern the colours in the yarn off to their best advantage. If you are buying their wool, be aware that some of their yarn weights are not quite standard and ask about needle sizes appropriate for what you are buying. This isn't true of their chunky yarn, however, which knits beautifully on 6mm needles. For the cabled headband, apart from the buttonhole section, I used 8mm needles to give a looser knit. Strathearn Fleece & Fibre have a website and Facebook page where you can find out more about their farm, wool, fairs and on-site open days and special events. If you are looking for wool or equipment for spinning or needle felting, they have that too. They also run courses throughout the year. I had a great day at the New Lanark Spring Food and Gift Fair on Monday. We were there with a Janet & John stall, selling a variety of crafts from our shop, as I have found that knitting doesn't tend to sell much in May. There were some of my 2 cup teapots with cosies, a selection of mobile/ipod cases and Kindle cases of various sizes. I was demonstrating knitting my free mobile phone knitting pattern during the day. 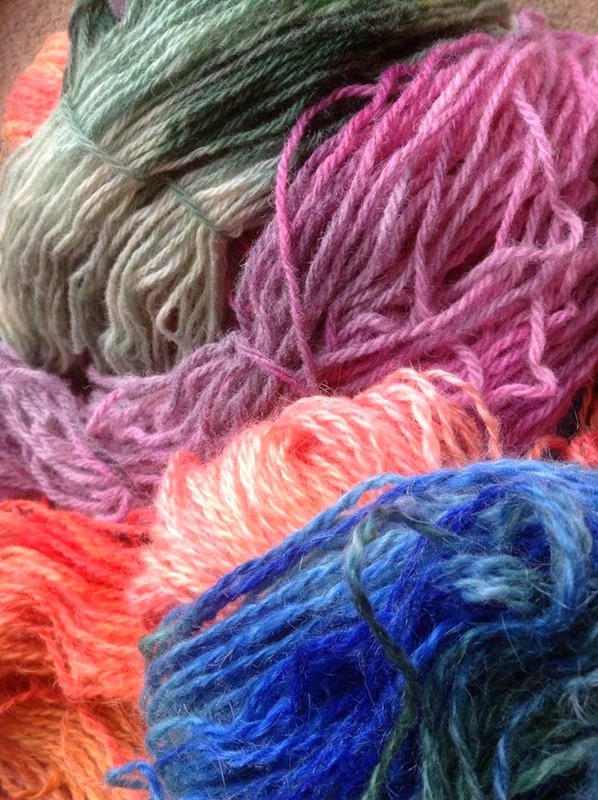 It was lovely to see two independent yarn sellers there with hand dyed yarns, as well as New Lanark wool. I bought a beautifully coloured skein from Yarns To Dye For for just £11. From it I've knitted a hat and a tea cosy for a 2 cup tea pot, and I've a little left over to add a colour stripe to a hat at a later date. The green blob is a bush in the garden, not an oddly placed pom-pom! The hat may well get sent to the Loch an Eilein Gallery later in the summer, whilst the tea cosy will appear on a Price & Kensington teapot in Janet & John in a few weeks. Whilst I was at New Lanark, I had rather a surprise. My husband John was looking round the Institute building where the fair was being held and came back and said that he was sure that the cushion in the display case on the ground floor, next to the mill tour pay desk, was mine. "No," I said, "I've got one in the gift shop", but he was right! Quite an honour, even if it does mean that that one isn't currently on sale. 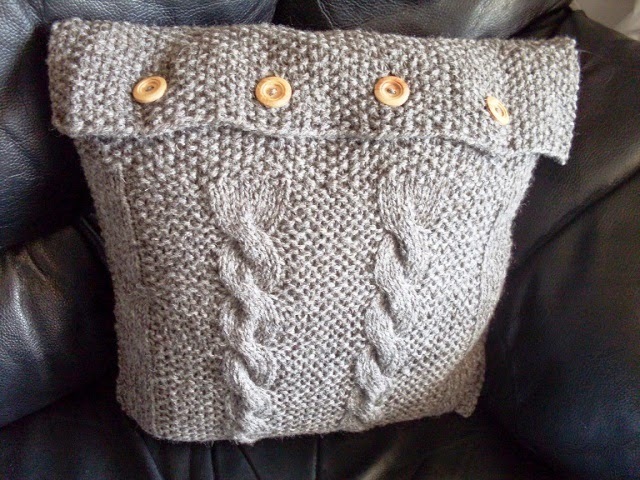 If you happen to visit, it's knitted in ecru Aran New Lanark wool in an intricate cable pattern, with wooden buttons. Silly me forgot to take a photo! I'll blog again about the other wool seller at the fair when I've finished knitting her skein. It's been a while since I posted anything. My husband and I have been concentrating on establishing our Scottish arts and crafts shop/gallery in the West End of Glasgow, called Janet & John. My hot water bottles with cases were popular purchases in Janet & John at Christmas time. I've been knitting all Winter, though, probably more than in the same period in 2012-13. I have a wonderfully comfortable armchair in the shop, in which I can work when the shop is quiet. I sold a lot of my work in Janet & John in the run up to Christmas. Thankfully, I was able to put some of the stock that came back from the Loch an Eilein gallery in early November straight into Janet & John, or I'd never have kept up with demand in November and December. My 2013 design Christmas tree decoration, a stocking with a cute wooden heart button. By Christmas, it was clear that I couldn't continue to stock Janet & John, the Loch an Eilein Gallery and fill tables through the Spring 2014 craft fair season. Although I could not get confirmation at that stage that I would be exhibiting at the gallery on the Rothiemurchus Estate this year, I decided to concentrate on knitting for there and the shop and not to exhibit at fairs until the Autumn. We have booked a number of "Janet & John" stalls at craft fairs through the Spring and Summer and there will be Baljaffray Handknits items on those stalls. These are listed on my Craft Fairs page (link top left). Our next one is at New Lanark on May 5th - this is a fair I've exhibited at for the last 4 years, though it will be our first time there with a variety of arts and crafts from the shop. I'll be demonstrating my free mobile phone case (available on this website) during the day. With less than a month to go until it re-opened, I heard at last that I would again be exhibiting at the Loch an Eilein. They were in the process of changing manager, which accounts for their late notification, and they're now open for business again, until early November. Thankfully, my decision to build up stock to take has paid off and there's a wide variety of my work to be seen there. I needed to knit large quantities of everything for delivery to the Rothiemurchus Estate, including paper cup cosies! By contrast, I have significantly reduced the quantity of knitting in Janet & John until the Autumn. We still stock my mugs with cosies, tea cosies, cafetiere cosies, phone cases, other gadget cases and purses. A two cup Price & Kensington teapot with cosy is still £10 in Janet & John. Just today, I have booked my first Baljaffray Handknits stall for 2014. 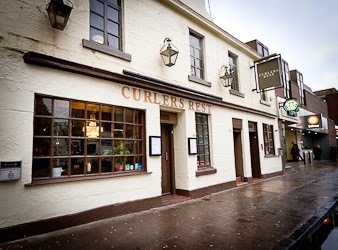 I will be at The Curlers Rest in Byres Road (very near our shop) on August 23rd. I've already booked three Autumn Byres Road Makers Markets and a November date at Greyfriars Kirk in Edinburgh and hope to add another couple in Glasgow in late November or early December. I'll post some design photos over the next couple of weeks. 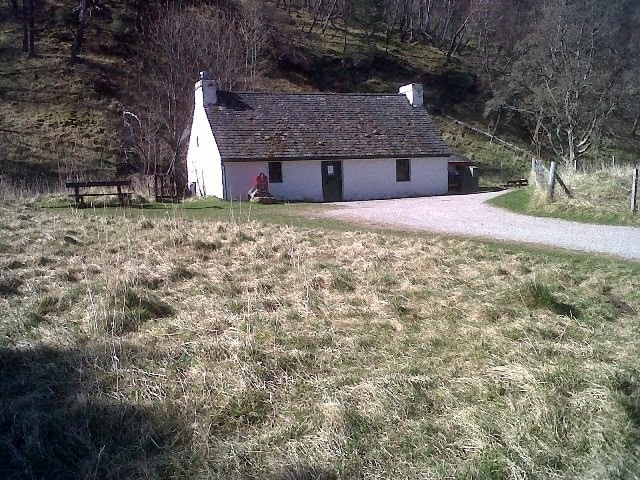 In the meantime, there's lots of photos from the Loch an Eilein delivery on my Baljaffray Handknits Facebook page. My last fair of 2013 has been and gone and I have decided to take a break from the craft fair scene as Baljaffray Handknits for a while. I am therefore not booking any events in the New Year at this stage. I need to concentrate on our Janet & John business and may do some Spring fairs under that umbrella, where my knitting will be available alongside the work of the many other artists and crafters we have the privilege to stock. Baljaffray Handknits is not likely to return to craft fairs in its own right until Autumn 2014. In the meantime, I'm still knitting! My work can be found in Janet & John, The Magpie's Eye Gallery in Govan and a limited range can be found in the gift shop at the New Lanark World Heritage Site. I hope to return to the Loch an Eilein Gallery on the Rothiemurchus Estate next year(Easter - Oct), but this has yet to be confirmed. Thank you to all my customers who have supported me in 2013. 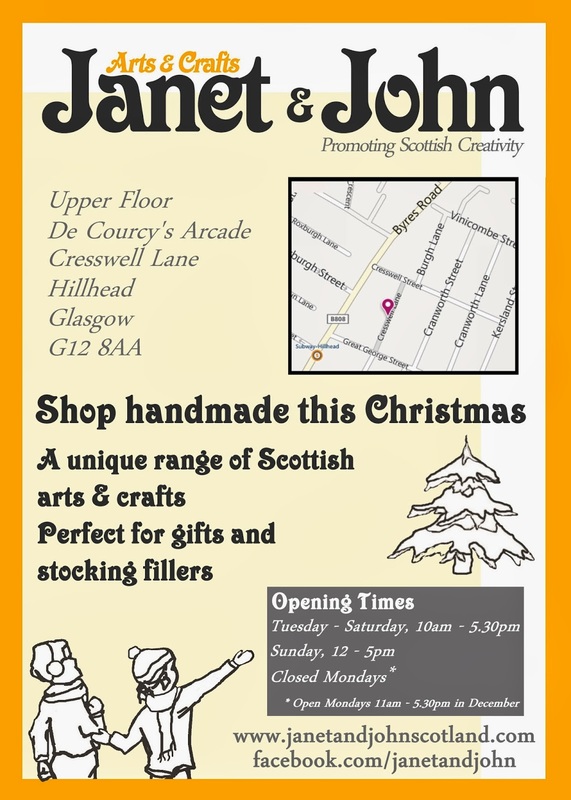 If you're in Glasgow, come and see me in Janet & John. Items for the home, accessories, hats and scarves handknitted in Scotland with locally produced wool. I update the Baljaffray Handknits Facebook page regularly with photos of new designs, news and information about upcoming craft fairs.